I have great fondness for Estonia, in part because it was the first post-communist nation to adopt the flat tax, but also because of the country’s remarkable scenery. Most recently, though, I’ve been bragging about Estonia (along with Latvia and Lithuania, the other two Baltic nations) for implementing genuine spending cuts. I’ve argued that Estonia is showing how a government can reignite growth by reducing the burden of government. Not surprisingly, some people disagree with my analysis. Paul Krugman of the New York Times criticized Estonia yesterday, writing that the Baltic nation suffered a “Depression-level slump” in 2008 and has only managed an “incomplete recovery” over the past few years. I have a positive and negative reaction to Krugman’s post. My positive reaction is that he’s talking about a nation that actually has cut spending, so there’s real public-sector austerity (see Veronique de Rugy’s L.A. Times column to understand the critical difference between public-sector and private-sector austerity). This is a sign of progress. In the past, he launched a silly attack on the U.K. for a “government pullback” that never happened, so what he wrote about Estonia at least is based on real events. My negative reaction is that Krugman is very guilty of cherry-picking data. 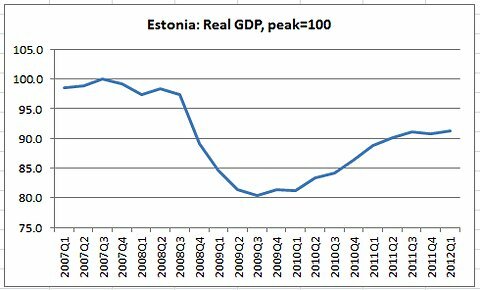 If you look at the chart that accompanies his post, Estonia’s economic performance isn’t very impressive, but that’s because he’s only showing us the data from 2007-present. The numbers are accurate, but they’re designed to mislead rather than inform (sort of as if I did a chart showing 2009-present). But before exposing that bit of trickery, there’s another mistake worth noting. Krugman presumably wants us to think that the downturn coincided with spending cuts. 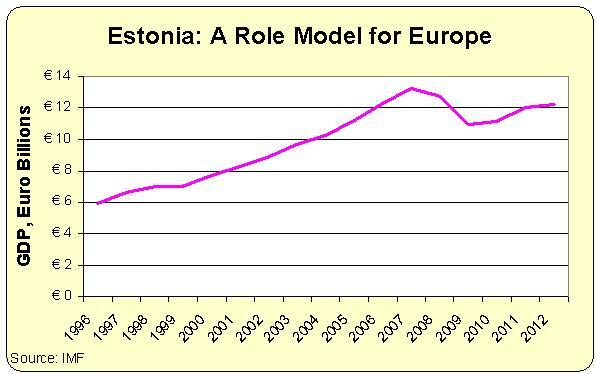 But his own chart shows that the economy hit the skids in 2008 – a year in which government spending in Estonia soared by nearly 18 percent according to EU fiscal data! It wasn’t until 2009 that Estonian lawmakers began to reduce the burden of spending. So I guess Professor Krugman wants us to believe that the economy tanked in 2008 because of expectations of 2009 austerity. Or something like that. Returning now to my complaint about cherry picking data, Krugman makes Estonia seem stagnant by looking only at data starting in 2007. But as you can see from this second chart, Estonia’s long-run economic performance is quite exemplary. It has doubled its economic output in just 15 years according to the International Monetary Fund. Over that entire period – including the recent downturn, it has enjoyed one of the fastest growth rates in Europe. This doesn’t mean Estonia is perfect. It did experience a credit/real estate bubble, and there was a deep recession when the bubble burst. And the politicians let government spending explode during the bubble years, almost doubling the budget between 2004 and 2008. But Estonia reacted to the overspending and the downturn in a very responsible fashion. Instead of using the weak economy as an excuse to further expand the burden of government spending in hopes that Keynesian economics would magically work (after failing for Hoover and Roosevelt in the 1930s, Japan in the 1990s, Bush in 2008, and Obama in 2009), the Estonians realized that they needed to cut spending. And now that spending has been curtailed, it’s worth noting that growth has resumed. What makes Krugman’s rant especially amusing is that he wrote it just as the rest of the world is beginning to notice that Estonia is a role model. Here’s some of what CNBC just posted. Sixteen months after it joined the struggling currency bloc, Estonia is booming. The economy grew 7.6 percent last year, five times the euro-zone average. Estonia is the only euro-zone country with a budget surplus. National debt is just 6 percent of GDP, compared to 81 percent in virtuous Germany, or 165 percent in Greece. Shoppers throng Nordic design shops and cool new restaurants in Tallinn, the medieval capital, and cutting-edge tech firms complain they can’t find people to fill their job vacancies. It all seems a long way from the gloom elsewhere in Europe. Estonia’s achievement is all the more remarkable when you consider that it was one of the countries hardest hit by the global financial crisis. …How did they bounce back? “I can answer in one word: austerity. Austerity, austerity, austerity,” says Peeter Koppel, investment strategist at the SEB Bank. …that’s not exactly the message that Europeans further south want to hear. …Estonia has also paid close attention to the fundamentals of establishing a favorable business environment: reducing and simplifying taxes, and making it easy and cheap to build companies. Good policy makes a difference. But it also helps to have rational citizens (unlike France, where people vote for economic illiterates and protest against reality). While spending cuts have triggered strikes, social unrest and the toppling of governments in countries from Ireland to Greece, Estonians have endured some of the harshest austerity measures with barely a murmur. They even re-elected the politicians that imposed them. “It was very difficult, but we managed it,” explains Economy Minister Juhan Parts. “Everybody had to give a little bit. Salaries paid out of the budget were all cut, but we cut ministers’ salaries by 20 percent and the average civil servants’ by 10 percent,” Parts told GlobalPost. …As well as slashing public sector wages, the government responded to the 2008 crisis by raising the pension age, making it harder to claim health benefits and reducing job protection — all measures that have been met with anger when proposed in Western Europe. It’s worth noting, by the way, that government is still far too big in Estonia. The public sector consumes about 39 percent of economic output, almost double the burden of government spending in Hong Kong and Singapore. But, unlike certain American politicians, at least the Estonians understand the problem and are taking steps to move in the right direction. I hope they continue. P.S. The President of Estonia, a Social Democrat named Toomas Hendrik Ilves, used his twitter account to kick the you-know-what out of Krugman yesterday. For amusement value, check out this HuffingtonPost article. P.P.S. A few other nations, such as Canada and New Zealand, also imposed genuine spending restraint in recent decades and they also got good results. People are aware that a recession occured globally in 2008, its ridiculous to argue Krugman was implying it was due to spending cuts. Also, after the recession, Estonia’s GDP per capita has grown at rates slower than the the US’s GDP per capita n. And, that is the relevant period of inquiry. Not whatever happened prior to recession. However, you are. You imply that Estonia’s austerity program after 2008 is responsible for its pre-recession boom. Which makes absolutely no sense. Krugman blames the weakness of the recovery on austerity, not the downturn. The latter was of course due to the financial collapse. is often a merchant cash loan provider that pioneered the organization more than 10 years ago. It’s really very complex in this active life to listen news on Television, thus I only use world wide web for that reason, and obtain the newest information. Krugman does not want to touch the subject of growth in Estonia because Estonia have implemented a Land Value Tax. It is actually the market incentives created from the land value tax (not the tax revenues) that are giving Estonia it’s growth. And Krugman does not want to admit it. So you will never see Krugman talk about Estonia. According to Raimo Poom: if Estonia could not use EU funds, then, in order to have similar amount of spending as today, its government debt would need to be 31% instead of 11% by 2013. So, austerity always shrinks the economy. If you want growth, then you need to spend, Estonia is actually an example of using stimulus for recovery (+ some other aspects), Krugman could use this in his book, but he currently he seems to be unaware of that. There was no global recession then. The question is, how is Estonia doing compared to how the rest of the world is doing? Pretty damned good. Someone who actually knows what they are talking about would notice that. Yes, that global housing bubble. Krugman won’t be mentioning his previous pronouncements. Nor his advocating purchasing of Enron stock while he sat well paid on their board and was blind to the fraud going on. Some economist. He’s more like a megaphone for rent for politicians selling stimulus spending. And someone happy to sell out the US. Justice would be forcing him to invest all his assets in 30 year US treasury bonds. on June 10, 2012 at 9:08 pm The Establishment’s False Solution to Public Debt | Complete Debt Relief - Info and tips on debt relief and cutting credit cards! stpioc – you are exactly incorrect. As Dan pointed out the cuts did not take place until 2009, well into the downturn. Uhhm, starting the data from 2007 is actually correct as that is when the big spending cuts in efforts to restore competitiveness (‘internal devaluation’) started. Do you not realize that the expanded data series only further emphasizes Krugman’s point and invalidates your own, look at the difference in post recession growth rates. Someone who actually knows what they are talking about would notice that. It appears, that like Krugman, ideology guides your opinion rather analysis of the relevant data. You are exactly like the person you oppose only you come from a different side of of the political spectrum. Is Krugman so tied to the anchor of his Kenyesian Titanic that he can’t jump ship? Oh well, another inductee into the Jimmah Cotter Institute for Stubborn Idiots. Great message, poor geography. Someone should tell him the Sydney harbour bridge ain’t in NZ. That’s a bit like pitching the Statue of Liberty n Canada. richard40, actually the Baltic states were under Soviet Union the least amount of time, the other Soviet Republics suffered much more and that is probably one reason they are not as developed as Baltics are. I find it a bit interesting that the 3 baltic states, which had been under USSR communism longer than anybody else, are now the most committed to the free market. Perhaps being in the USSR taught them a lot about what NOT to do, unlike that idiot Krugman. One more reason we need: DMBAZZ, the first Double-Short Krugman ETF. And more – Krugman called Latvia ‘the new Argentina’ back in 2008. But it looks like the great ‘devaluation’ he was predicting never happened. Latvia made tough cuts, stopped the bleeding, and has turned the corner in many ways. > that Estonia is a role model. No, he wrote it *because* it is becoming a role model, and it doesn’t follow his prescription. The narrative comes first, evidence is constructed to fit. I second this. I came here to say exactly this when I read this at Instapundit. What is particularly funny is that the Estonian President, having grown up in New Jersey and having graduated from Columbia U., responded with a series of very acerbic tweets, highly critical of Krugman. In the long run, Estonia’s economic policies will matter little if it doesn’t fix its low birthrate and aging population. We all read How to Lie with Statistics in in high school or college, right? Little did we know that some people, like Krugman, would use it as a instruction manual. This trick is literally right out of the book. PS: I think that more should be made of the fact that a prominent social democrat is lambasting Krugman “from the right”. The Estonians have indeed an outstanding sense of responsibility even by th standards of Northern Europe. However, I think that the 2nd chart is sufficient to explain why they stuck to free-market policies: they want to return to the pre-crisis rates of growth, so they stuck to pre-crisis policies. Plus, as can be seen from the chart, even at the bottom of the recession Estonians were still 10% richer than they had been only 5 years earlier. In Western Europe, 2% annual growth would be pretty good going even without a crisis. Fascinating Stuff. I build web sites. I had an unsuccessful hacking attempt on one of my sites, awhile back, and I traced the hackers into a section of Talinn. In my efforts to learn more about lawful options, I discovered that there is a section of Talinn (a very picturesque city on the Baltic, built by the Swedish empire, complete with castles and city walls) that is called the “Silicon Valley of the Baltics”, where there is a huge surge in new computer and technology companies. This surge is largely due to very relaxed laws governing business start-ups, technology, copyrights, etc. Seems pretty free-wheeling, from all accounts. It also serves as an example of how to start up a technology enclave (or any other business sector, I assume) – relax government intrusion via regulations and licensing. Needless to say, that is where my search for the hackers ended and it became apparent that, even if I were to identify them, there were few options to pursue them legally. So Krugman continues, as Daniel Okrent once observed, “Selectively citing numbers in a fashion that pleases his acolytes but leaves him open to substantive assaults.” In other words: dog bites man. It seems that some actual adults are in charge in Tallinn, and there is enough of a plurality of sober adults connected to reality in the electorate to make those in charge comfortable with doing the sane thing. I wish I could say the same about the Land of the Free, but there are too many here pandering to the looter class with extravagant tales of printing-press prosperity to allow that to happen. So Krugman wonders, how do we get Estonia’s money to Greece.